Anyway, If any of you read my blogs then you know I have struggled with religion and matters of faith for a while now. I have not gone to church in years. I really thought the whole place was going to burst into flames as my husband and I walked into the church today. Plus, I felt really bad attending without at least going to confession. 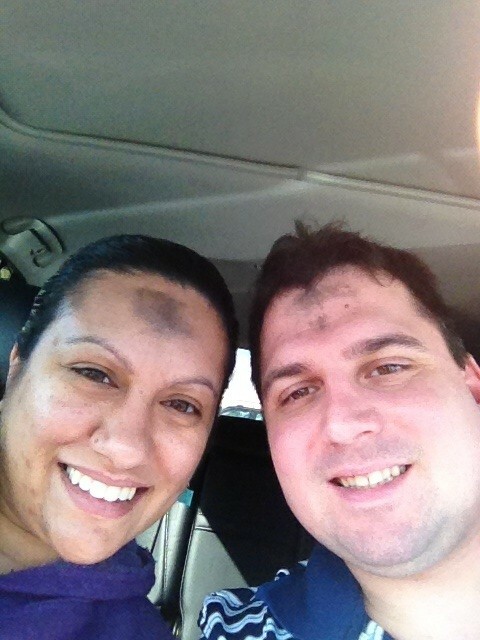 I am not sure what possessed us to go to church today, but my husband mentioned that it was ASH WEDNESDAY and of course we had to go. I did a little research and we found a local church. As I entered the church, I noticed the lack of holy water by the entrance and made a comment to my husband. I think the priest may have heard us, since he decided to make mention of it in the middle of the sermon and pointed to a baptism pool in the middle of the altar. He then proceeded to splash the first row of attendees with the water from the baptism pool. Mike and I looked at each other and laughed like two adolescents, and then proceeded to sprinkle ourselves with holy water as we were leaving the church. Of course we did not leave without getting our ashes, singing some hymns and getting a registration card. My husband decided that we need to be a part of a church and that I should attend one while he is gone on deployment. I could not help but agreeing. He does not ask for much and it is the least I could do while he is away. Prayer is good and helpful when he is gone for such a long time, and I am ripping my hair out not knowing where he is. I barely get to speak to him to make sure he is ok while he is away. I must say it did feel good to attend church. Whether my beliefs change or are absent, I felt at peace for that one hour. In either case, I am glad we got ashed today. I have not posted in a while about my dreams. Maybe it is because they have been extremely ilogical. I am finally convinced that I may be having seizures when I sleep, which is why these dreams are happening…If right now your asking yourself what the hell is she talking about now? Is she serious? The answer is yes!…..I am not joking and these random things do come out of my brain. Last night, as I was sitting in my room watching a Steven Hawking special on cable TV, I started to think about a dream I had recently. I also thought about something that happened to me when I was a child. All of this made me contemplate that I kind of have an obsession on questioning religion, and its been an internal struggle of mine since I was born. I have spent years searching for the “right” religion, and feeling like I am not a very good person because I do not attend church on Sundays. It all started when I was about ten-years-old. I was a devout sunday school attendee and I was a reader in our local church. I attended church almost every Sunday. I prayed every nigh before bed. I even made my own altar/church at home, out of boredom. I was a child, so I did not know at the time that sermons were only given by male priests. I attended an all girls catholic school and I wanted to be a nun. Then, the day of my holy communion arrived. My grandmother was happy and proud that I had achieved this religious milestone. But, I really was too young to understand what it was that I was accepting and vowing to do. I just followed and did what everyone else was telling me to learn. I thought it would be simple to just donate to the poor, attend church and read the bible. As I was walking in a line to take the host, my candle broke in half. I was devastated, thinking I did something wrong or that maybe I was not worthy. I was only ten! Plus I did not understand why I was taking the host. “Am I eating God, I thought?”. Later on, as I no longer attended church, did not read the bible and simply did not see the point, I attended a Born Again Christian church, a Catholic Church, a Baptist Church and even a Jehovah’s Witness church. Not one of them convinced me that they were the “right” religion, and that I should embark in this bible reading crusade again. Which brings me to the creepy dream I had not long ago. I was in a strange forest-like place. It was the middle of the night and I was being interrogated about my belief in God or not. I denied my belief and was ordered to go into a bus. Not me nor the other people who were standing there, knew where we were going. Then I thought, in this dream, “Is this the bus to Hell because I denied Christ in my interrogation?” Well, I woke up upset and worried from that dream. I felt like that kid that stole a cookie from the cookie jar and knew he or she was going to get punished for it. My internal struggle came to a peak last night, when Steven Hawkin said that it is his scientific opinion that God does not exist. Out of the numerous reasons, he mentioned the fact that the Big Bang occurred spontaneously out of nothing, and that basically all the positive energy and all the negative energy (black matter) that exists in the universe equals to zero. Therefore, there is no room for a God. I was in shock. Could it be that there is no God? But, what about all the paranormal and weird things that happen out there, which violate all natural laws and explanations? What happens to them? What internal energy could have caused the Big Bag? I already do not believe in creation. I do see evolution in everyday things. But what about the very existence that something was made out of nothing? Even though numbers do not lie, and all the positive energy and black matter in the universe equal zero…what about numbers that are less than zero? Maybe it just took a fraction of “divine” energy to get things started. If black holes represent black matter where time does not exist, what made time and the black hole exist in the first place? There are many theories out there, but not everything is Black and White. So to say “there is no God”, is too strong of a statement for me. I rather think thus far there is no evidence, but all theories are just theories until proven. Until then, my internal battle will continue….